Looking to get the best sound from your mics and instruments? The Sonora 2 is a great place to start. Silky sound quality. Two matched channels. Plenty of headroom. Price is probably too high to justify casual use. Sontronics released the Sonora dual preamp and DI box more than four years ago so it's high time it released a revised version. So what's new in the Sonora 2? Well, when the original appeared there were a couple of features that were definitely on the wishlist for increasing the practicality, and the company has responded by providing both. "There's now a phase reverse function with a switch for each channel and the rear panel on/off has been replaced by a very useful ground lift switch,"
First up is a phase reverse function with a new switch for each channel and secondly, the rear panel on/off switch has been replaced by a very useful ground lift switch, (you turn the unit on and off by a switch on the remote power supply). The phase reverse has been accommodated by changes in the Sonora's design, which now, rather than having separate front-panel sockets for mics and instruments, features neat Neutrik combi XLR and jack sockets. You also get new blue LEDs to show you when phantom power is turned on. Entirely made in England and very solidly put together, the Sonora 2 is designed to be relatively portable so you can use it on your table-top at home or easily carry it to a session. It's basically in two parts with the external power supply being connected to the actual preamp unit by a 3m cable so it can be placed away out of sight. With the transformer located in the PSU, it's also kept well out of the signal path, eliminating any chance of it adversely affecting the audio. 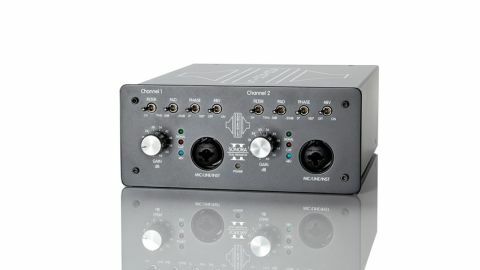 Output for each channel is available on balanced XLR and balanced/unbalanced jacks, both of these outputs being simultaneously active so different recording and monitoring setups are possible. Each channel of the Sonora 2 features a gain knob and four switches in a line - there's a high-pass filter gently rolling off the lows below 75Hz, a 20dB pad, a phase switch and a phantom power on/off switch. The gain knob offers 66dB of gain in 6dB steps. "There's nothing complicated about using the Sonora 2 - everything is neatly laid out"
There's nothing complicated about using the Sonora 2 - everything is neatly laid out and the stepped gain knob makes it easy to recall exact settings from session to session and exactly match up the gains if you are using a stereo pair. Metering is basic but effective with single red and green LEDs for each channel. Sontronics claims a linear frequency response for the Sonora 2 and this was borne out by the results achieved when plugging in a series of mics, whose character was not at all compromised by the unit. What you get is low noise and a quality transparent sound with a quick response to transients. The Class A circuitry is Sontronics' own design and not a clone of any particular vintage gear, although the sound does have a vintage vibe about it with a very smooth top end. Connecting guitars and bass, we were equally impressed with the detailed sound, a Strat recording silkily, a Fender bass fat and rounded with a touch of compression added. If you like the sound of your mics and want to retain the character of your DI'ed instruments the Sonora 2 may just have the sonic transparency you need and, with the revisions to the original model, it is now an even more versatile piece of gear.